For those who don’t know Arthur Neville Chamberlain, he was the conservative British politician, who functioned as Prime Minister right before the second World War broke out. With his passivism, he allowed to let Nazism to grow until it was too late. Chamberlain negotiated several political agreements with Hitler. He was the one acting ignorant and naif. He allowed himself to be fooled and hoodwinked by the Nazis. The particular thing is, that Chamberlain was not without resources and the means of force. Force, which could be used as threat to keep Nazism under control. That threat could be enough to stop the rise of evil. But Chamberlain did not use that very important tool in his diplomatic efforts. The same with Obama, the President of the United States, the leader of the free world, the strongest country in the world. He also refuses to use the most powerful tool in the diplomacy, his very powerful armed forces. But Chamberlain was a gentleman, believing in the good of a human, naif, ignorant, but still a gentleman. He believed that using force was the last thing he could use. Obama seems to have the same mindset, except that his problem is more complicated. 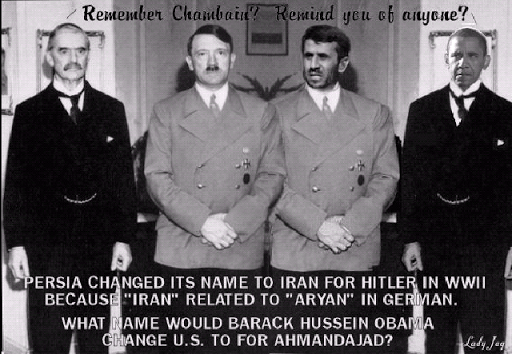 Chamberlain was confronted with only Hitler. Obama is confronted with multiple erupting happenings. Obama also is rather confused about what’s going on in the world. He is not only naif and ignorant, but stubborn as well. That’s a very dangerous situation. With almost two years in office, this does not promise well for the future of the world. Obama in Trouble? Does he suffer from Avoidant Personality Disorder, a serious Social Phobia? 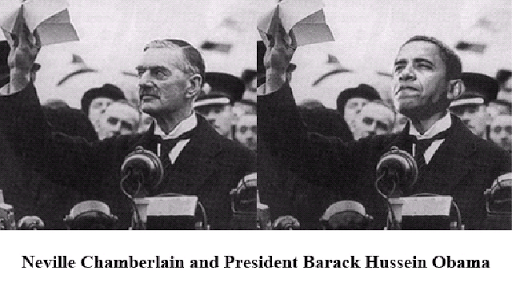 While Chamberlain was being ignorant and naive, what was America doing? So Chamberlain doesn’t look so bad after all. At least he made an effort. And it was more than ‘denial’. Hitler was Time magazine’s man of the year. Americans invested heavily in Germany. America turned away Jewish refugees (sound familiar?). When Hitler rearmed, America did nothing. Indeed. The whole situation then is also the situation now. Let’s hope it will not be followed up by the disaster the WW2 was for the world and everyone on earth. No, he was simply stupid and not a person suppose to be in that position. It was a dreadful time. And Chamberlain was one of the old school diplomates. Even that old in that time.